Your Newstead Dentist and team at Precision Dental is highly driven and accredited practitioners with outstanding expertise in modern dentistry. 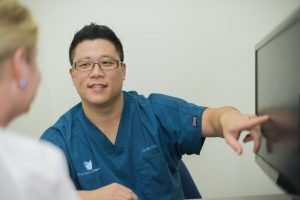 Meet our dentist – Dr. Billy Choi, registered with Dental Board of Australia and a member of the Australian Dental Association, Australian Association of Laser Dentistry and Australian Society of Implant Dentistry.Billy has had over 10 years of experience in all aspects of general and cosmetic dentistry. His aim, along with his proficient team, is to help patients maintain a healthy mouth and acquire beautiful smiles by offering high-quality dental treatments and superior dental service in Newstead. Precision Dental only delivers the finest and exceptional ethical care in the field of dentistry. In addition to this, we provide a comprehensive list of general, preventive and cosmetic dental services in order to meet the needs of our patient and their whole family. Book A Consultation in Newstead Today! Your reliable Newstead Dentist here at Precision Dental wants you and your entire family to achieve optimal dental and oral wellness so you won’t miss the experience of having healthy and admirable smiles throughout your lifetime. Keep in mind that oral wellness is an essential part of your overall wellbeing. Thus, all of us must give it with sufficient attention. If you need any dental services, call us on (07) 3852 1160 to set an appointment for yourself or your loved one. Dr. Billy Choi, your dependable dentist Newstead, is pleased to answer any dental inquiries you may have. Contact us today. Newstead is located 3 kilometers north of the Brisbane CBD, a riverside suburb of Brisbane, Queensland. Newstead is known for trendy restaurants and café as well as upmarket studio apartments and modernized older homes with well-established gardens.